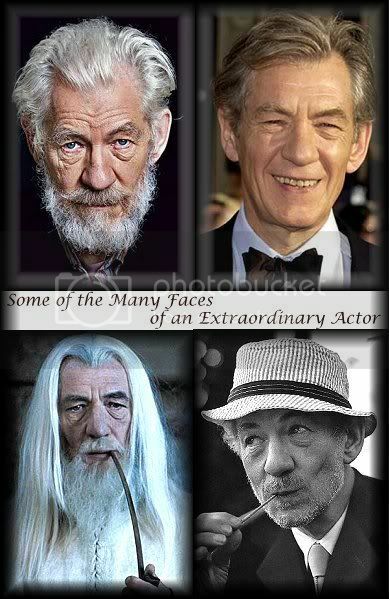 Sir Ian McKellen... our very own beloved Gandalf. 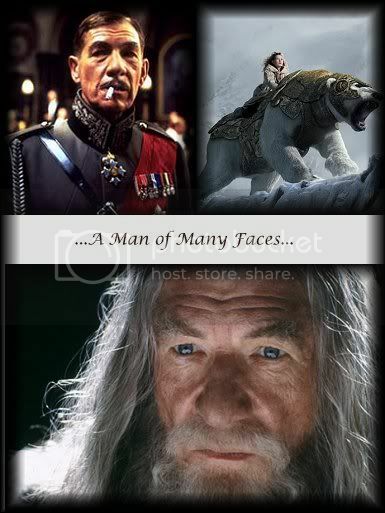 I love Gandalf. 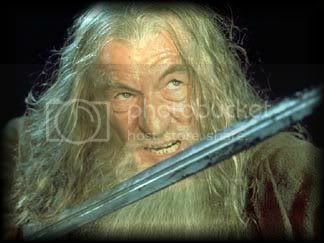 And I love Sir Ian for his magnificent performance as Gandalf.. I've read it all, even though it's well after the movies were made. I do like reading what he had to say and if you think you would just use the link above. 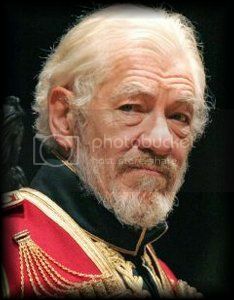 I * *Sir Ian McKellen! 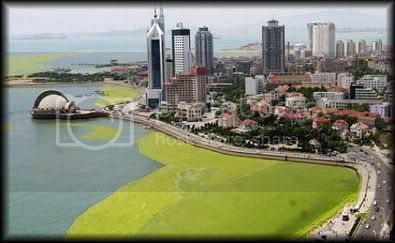 Pollution and Algae... oh my! Is Beijing dangerous to athletes' health? With the prospect of athletes running marathons and cycling in Beijing's smog and pollution-laden air, environmentalists and experts in sports medicine are concerned about the health risks associated with the Olympic Games in China. 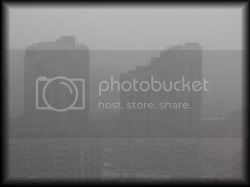 The Beijing smog feeds on itself. Whenever the city periodically disappears into a brownish-yellow haze, the traffic only gets worse. Those who are fortunate enough to own a car leave their bicycles at home, choosing air-conditioning over the unfiltered cocktail of coal smoke, particulate matter and ozone in the air. 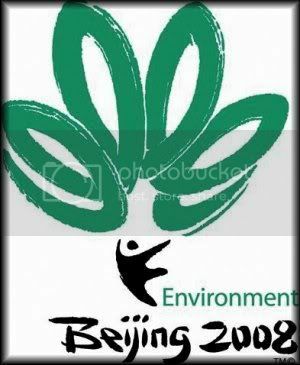 But escaping to the relative comfort of a car's interior won't be an option for those traveling to Beijing in August 2008, when more than 10,000 athletes will compete in the Olympic Games in one of the world's dirtiest cities. China has promised what it calls "Green Games," but its pollution figures suggest the more grayish hue of smog and pollution. 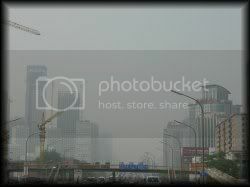 The air is often thick with pollution in Beijing, a city of 11 million. When there is no rain or wind, ozone and fine dust accumulate, often to a rate that is two or three times the maximum levels recommended by the World Health Organization (WHO). The fine dust stems mainly from coal power plants and factories, while vehicle exhaust gases are responsible for the ozone. The city's constant traffic jams have reduced the average speed of the cars on its streets from 45 kilometers per hour (28 miles per hour) in the past to only 12 today. Adding to the problem, more than 1,000 new cars are registered each day. Even healthy visitors often complain of sore throats, allergic reactions and asthma. In China's 14 largest cities alone, air pollution is responsible for the deaths of 50,000 newborns each year, writes the Shanghai Star newspaper. "If you exercise," advises Ibrahim Salahat of the International Medical Center in Beijing, "you should do it inside." I have to say this........... I do think the Olympic Committee should take more time to look into the cities that want the Olympics, ..... Our athletes health is worth it. 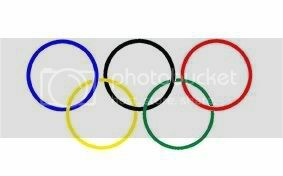 I find I am actually nervous about this years Summer Olympics. I guess I always am a little nervous whenever and where ever they are held, but this one in Beijing could be a health hazard to many athletes... it's just not right. Amazon gives a good review of this book, and I doubt I could do better. It was a book that I wasn't sure if I'd like or not, but took a chance, and I'm glad I did. It's a coming of age book, but it also takes a long hard look at the people who make up what is called "the Freak Show" at Carnivals and Circus's. This book gives a good look into the inside feelings of people who manage to survive despite their odds of doing so. And what you discover is that they aren't as different as they may look. The protagonist, 17 yrs old, Abel, was feeling sorry for himself living with carnival freaks (his parents among them) when he was "normal", so he sets off to find himself ...and his destiny. Followed by the dog faced boy they find adventure, love, fear, and many new friends, who seem to be attracted to Abel as if he were a magnet. Try as he may he cannot leave the dog faced boy or his new friends behind when he see's they are not being treated with the respect they are due. He stays, and decides to do something about it. Good lessons are learned in this book... not the least of which is that no matter what someone looks like, beneath it we are all the same, wanting the same things, and hoping for the same happiness's. In the end, the old belief that you can never go home again, is found untrue. Annette Curtis Klause, Author's Notes: I may have started reading about unusual people out of curiosity, but what I brought away was respect- respect for people who fought the odds and created lives for themselves. They made the best of what they had, earned a living, love, married, had children, and left a legacy when the could- just like anyone. We are all different- and how boring life would be if we were all the same- but some of those differences may be more obvious than others, and present greater challenges. Yet one thing unites us- we are all human. First, the bad news.. my brother is back in the hospital. It's cellulitis again in his legs. He will be treated and depending on how well he responds he will be home in a week or to a rehab for further treatment. We expect him home in a week the way things are now. Ok.. so..this is both bad and good for me personally. Bad in that I hate, with a passion, having to go to the hospital every single night until he comes home. The "good" part is that I can leave the house with David. And yesterday he wanted to go look for new pants so I tagged along. 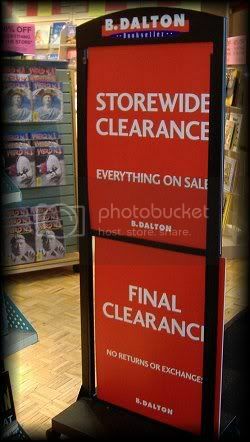 After shopping at Sears we went into the mall and low and behold.. I saw a Dalton book store! We went over "just to look". and look at the sign outside of the store! Hello? Can we say, I ran right in?!!!! It looks as if they still have a lot but actually the store was half empty already. Three new beauties! Total was 26.00. Not great but not bad! 40 percent off is a good savings! These three have been on my list for some time and I probably wouldn't have gotten them for an even longer time, but when a sale plops in you lap....... well, you know~! 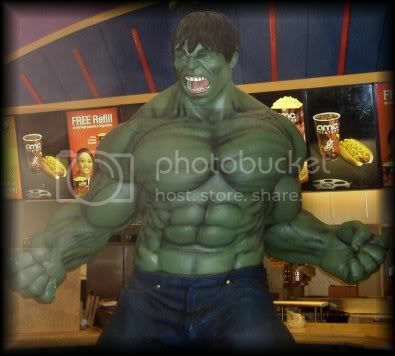 I had only planned on the above photo to prove I got to a theater but once inside I found the Hulk..... and he was big! 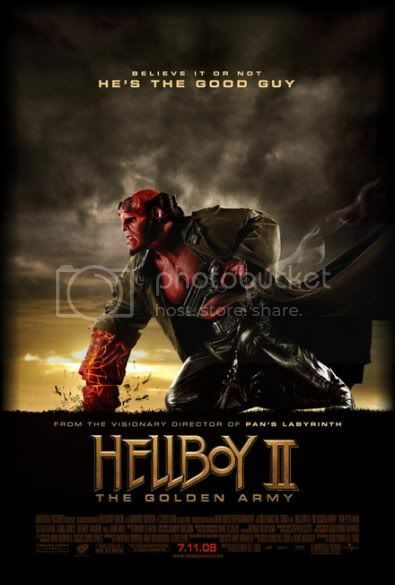 Then I actually got to see Hellboy II !!....... yiiiiiiii haaawwww! He even brought out "baby" for me! heh.. 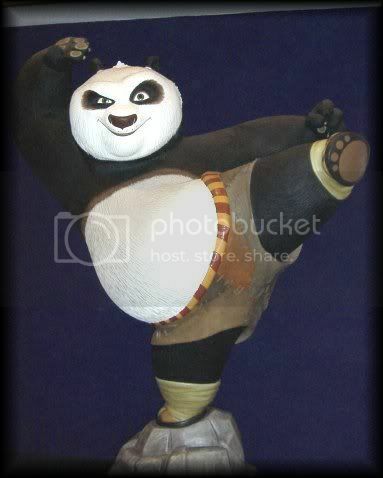 There was certainly no denying it was a del Toro movie, and no denying that the makeup artists, the costume design artists and the special effects folks, all had major workouts in this movie! Perlman has his character down to a "t", I doubt he needs much in the way of direction when he plays Hellboy anymore. The rest of the cast was great also. I love that they did little changing of the actors/ actresses that played the main characters to continue the franchise. And then there was Roy. ... ok the king. A small part but ..but... I would have gone to see any movie Roy Dotrice is in no matter how small the part. 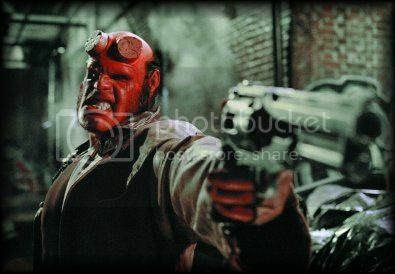 However, I do admit I would have seen Hellboy if he wasn't in this movie too. But he was wonderful. I hope, the powers that be, were smart enough to get all the signatures for the possibility of a next installment, which I feel sure there will be! 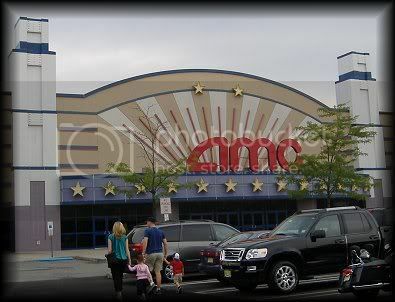 The movie was great! If you didn't see it you should plan on renting it or buying the dvd!! Once it's released it won't be on my "wish list" for long! 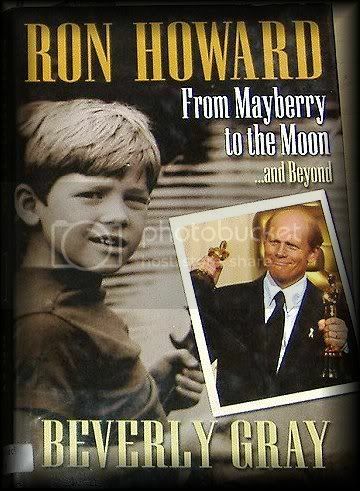 Amazon: Product Description: Ron Howard: From Mayberry to the Moon and Beyond, the first full-length biography of Ron Howard, takes an in-depth look at the Oklahoma boy who gained national fame as a child star, then grew up to be one of Hollywood's most admired directors. Although many show biz kids founder as they approach adulthood, Ron Howard had the advantage of brains, common sense, and two down-to-earth parents who kept him from having an inflated view of his own accomplishments. He also had a longstanding goal: to trade the glare of the spotlight for a quieter but equally creative life behind the camera. This biography tracks his career from 1960, when he debuted as six-year-old Opie Taylor on The Andy Griffith Show through 2002, when he accepted his Academy Award® as Best Director for A Beautiful Mind. Throughout the book it's noted (sometimes jokingly, sometimes not) that Ron cannot seem to rid himself of people still calling him Opie. The DiVinci Code - 2006. Considering that Rons career is far from over, this was a fairly good biography. For the most part in books like this when they begin to make each movie an individual chapter it gets drawn out and not so interesting. (well.. if you've seen the movies a rehash isn't all you want to read) I'm guessing this book wasn't too boring because I did read it to the end. I truly admire Ron's directing career... let's face it, .. he's good ! And I think he has a lot more in him before it's all over. Yes, I did watch him as Opie, and as Richie Cunningham and have probably seen just about everything he's done in front of the camera, and enjoyed it. But no matter how good the actor is (but you do need both to be good!)... what you see on the screen, is more how the director see's the story... and I do think Ron Howard has what it takes to be one of those exceptional directors. I pretty much knew most of his story.. how his parents were in the business and how they allowed him to act at such a young age and watched over him etc. So there were no surprises tucked away in this book, but that's not why I read Biographies and Autobiographies... I do read them in hopes to get to know the individual better.. and in hopes that what I read makes me admire him more and not less. I guess I want verification that the person I am reading about deserves my accolades. No surprises here. What you see is what you get... and so I continue to look forward to what Ron will give us next! 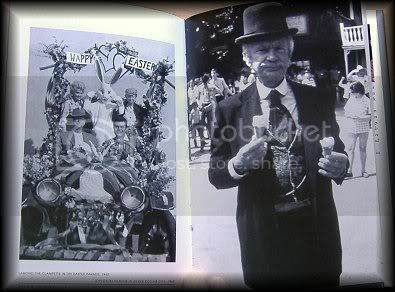 I remember this.. not the exact date but I remember hearing when Buddy Ebsen passed away. 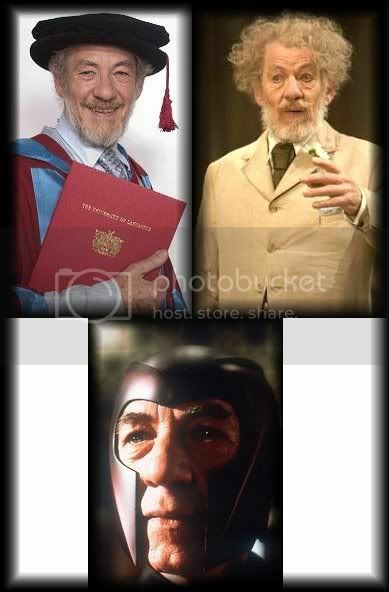 I was glad he got to live to 95.. but sad to have lost such a man. 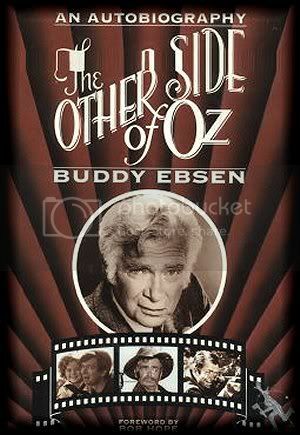 This post is about the book written by Buddy Ebsen (The Other Side of Oz) .. and also a little extra about the actor. 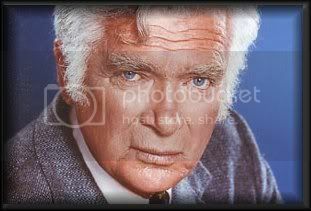 I know most who look at Buddy Ebsen see Jed Clampett.. not me. 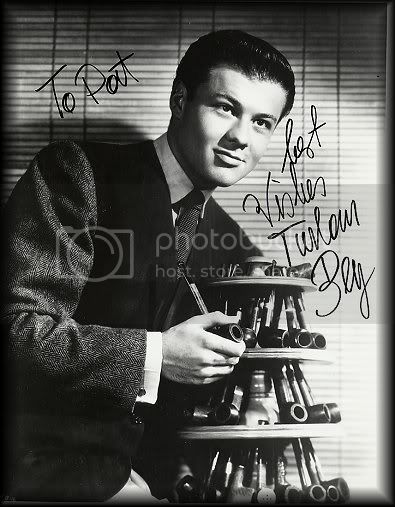 I am old enough to remember seeing his old black and white movies, when he danced with the likes of Shirley Temple and Judy Garland! And then color came to television.. and wow! I'm sorry but, old I am.. dead I am not! This was a good looking man, with gorgeous (I said GORGEOUS) blue eyes! Sorry.. no Jed Clampett here! 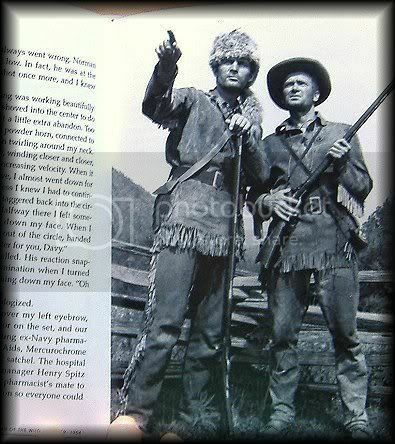 But besides the old movies I'm also old enough that I first fell in love with the handsome Buddy when he played Davey Crockett's side kick George Russel. I never missed that show! Two handsome devils for a young girl to swoon over! And..nope.. I wasn't watching it for the history lessons! A few weeks ago when I went to Comic Con I met and helped Lee Meriwether. Among her photo's she had two pictures of Buddy as Barnaby Jones and herself. After talking about the show Lee mentioned the book Buddy wrote. 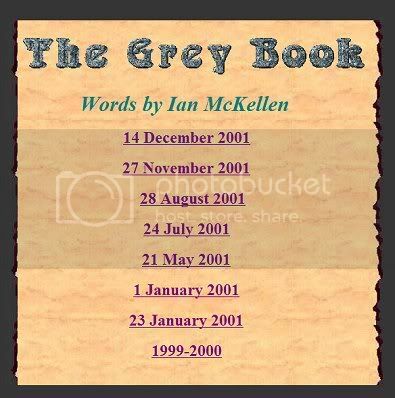 I have to admit I totally forgot about that book! But I did remember when it was mentioned.. so I came home and searched it on Amazon, found it was no longer being published then went in search for a used copy. 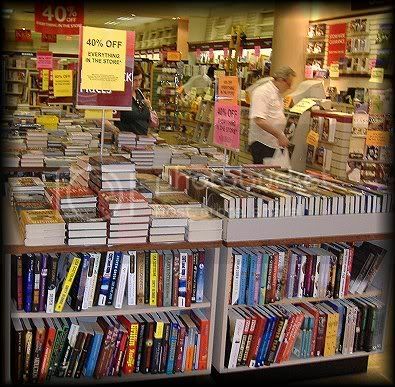 I have 3 places I check on for used copies of books... Amazon (naturally), Barnes and Noble (or course) and a place called Alibris. I've had good luck with Alibris. (all of them actually) This is the 3rd time I've trusted their sellers and purchased a used book and each time they are mailed in good time and come in fantastic condition. You'll get no arguement from me! Ebsen's career was launched when he and his sister Vilma danced in the Eddie Cantor Broadway hit Whoopee! and in Ziegfield Follies of 1934 . Later, in Hollywood, his co-stars numbered the likes of Judy Garland, Shirley Temple and Audrey Hepburn. Ebsen's media have included stage, radio, movies and TV, but he is best known for his roles in the long-running TV series Beverly Hillbillies and Barnaby Jones . In this memoir, the performer, who was born in Illinois in 1908, the son of German immigrants, recalls his early film experiences, especially as the originally cast Tin Woodsman in The Wizard of Oz --before he was fired. Unfortunately, despite the obvious richness of Ebsen's career, fragmentary reminiscences and amateur writing do not make for an involving autobiography. Photos. Copyright 1994 Cahners Business Information, Inc. I can't just put thisphoto here and not tell you .. I was totally shocked when this came in the mail.. the quality of this book is so fantastic it would be more than worth the original selling price of 24.99. It was published in 1993. Under the paper jacket lies a book that looks like (fake) leather. The binding is done better than any book I've every purchased. The paper is thick. (yes, you read correctly... THICK) The print is fairly large, though it says nothing anywhere about it being "large print".. it's double spaced, and it's filled (FILLED) with gorgeous photo's along with the story! I found myself just flipping pages and brushing my hand over the quality of the paper.. incredible! 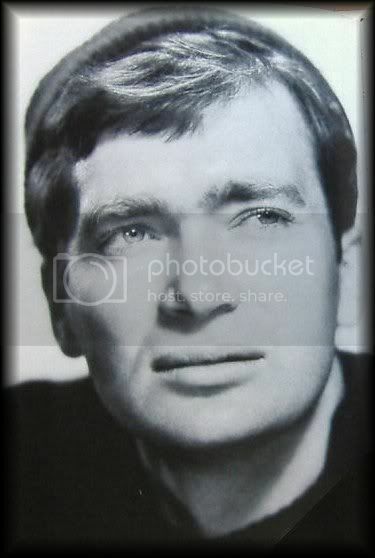 If you like celebrity Biographies or Autobiographies and happen to like Buddy Ebsen... It's worth finding a "used" copy as I did just to feel this book in your hands! .... teaming with Shirley for the delightful number "At the Codfish Ball." but Ray Bolger, who'd been cast as the Tin Man, talked Ebsen into switching roles. 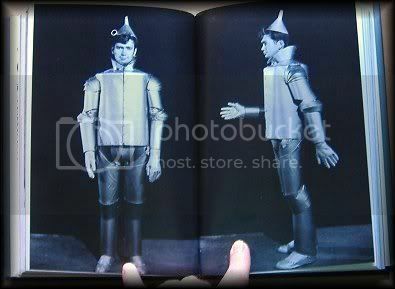 The move proved to be Ebsen's undoing; he found that he was allergic to the silver makeup required for the Tin Man, fell ill, and was forced to bow out of the film, to be replaced by Jack Haley (however, Ebsen's voice can still be heard in the reprises of "We're Off to See the Wizard").Ebsen then returned to thestage, taking time out to provide the dancing model for a electronically operated wooden marionette which later was used at Disneyland. which ran for nine years to excellent ratings. 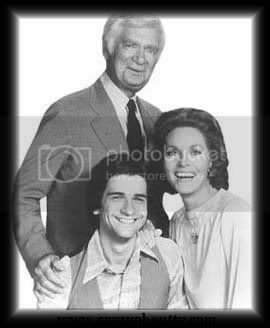 A millionaire several times over, Ebsen planned to ease off after Hillbillies, but in 1972 he was back in TV in the title role of Barnaby Jones. Few observers gave this easygoing detective series much of a chance, but they weren't counting on Ebsen's built-in popularity; Barnaby Jones lasted until 1980. I was assigned a dressing room suite and parking space on the Goldwyn lot. Two days later, an attractive young lady parked her station wagon nearby, got out, and approached me, smiling. "We've nnever met," she said. "I'm Lee Meriwether. I'm your new daughter-in-law". This former Miss America who had made a go of an acting career was referring, of course, to the role she had just won in the series. Her appearance was soft, feminine, belied by a strong, firm handshake. The skin texture spoke of a girl who works. This lady, I concluded, does her own gardening. I was totally unprepared for the phone call I got one day from Jimmy McHugh. "Ron Howard called today," he told me. "He wants to talk to you." 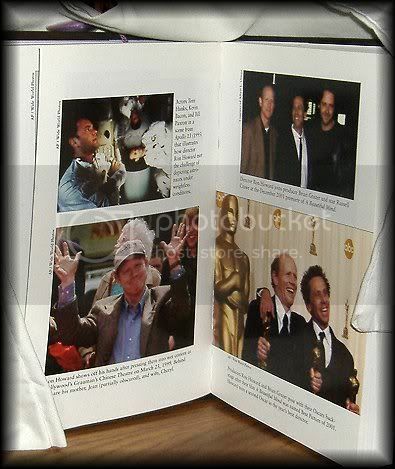 "A part in his new movie Cocoon." Fate sure knows how to torture a fellows. Here I was locked into a year with the television series, "Matt Houston," and the hottest director in town calls to talk about a part in his next project. I don't wish to disparage television or Matt Houston or its star Lee Horsley- a true gentleman and friend. But a part in the new Ron Howard feature? For the big screen? Wow! But a sad fact remained: I was unavailable, so the part went to Don Ameche. Don made the most of it and won an Academy Award. And even though he got what might have been mine, Don Ameche will always receive my highest marks as a talented gentleman of rare humor and humility. I wanted to tell this story for the millions of young men and women- and grownups too- who start out bravely every morning prepared to sell something, whatever it may be. I wanted them to know the story of someone, like themselves, who has been confronted by negative people who are secure behind polished desks, and who listen doubtfully as your pitch flops. So what to you do then? Ring up "no sale" and walk out of the office defeated? Never! Refuse to accept it! Just call it a temporary postponement of success. The difference between success and failure is often no wider than the thickness of a cigarette paper. Just as Dorothy, the Scarecrow, the Cowardly Lion, and the Tin Woodman stood up to the Wizard and won- so can you! Life's a brand-new ball game every day! Remember that of all the elements that comprise a human being, the most important, the most essential, the one that will sustain, transcend, overcome and vanquish all obstacles is... Spirit! I am so thrilled I have this book!! And to think I owe it all to Lee Meriwether!! (Thank you Lee!) I will tell you.. there are no great surprises in this book. No revealing, sorted affairs. And no huge Ego eccentric to be found. This book was a straight-forward telling of how Buddy broke into show business and managed to stay there and become the star we know. Everything about this book is pleasing. From the heavy weight, and the extraordinary quality of the book, to the well written story and multitude of photographs on the pages! I feel as if I have found a hidden treasure which will remain with me for the rest of my life! The only thing better would have been to have had the opportunity to meet this very fine actor in person. I mean Heat Wave Hot! It's been in the high 90's for days now. 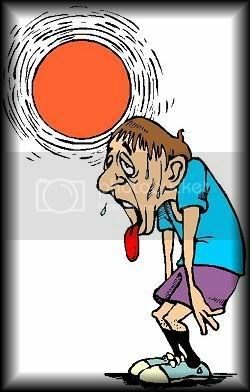 Did I mention I have no air conditioner in my room? Oh. Well. I don't. So whatever the temps read outside... they pretty closely read the same inside. My room has been averaging 90 degrees. So I've been sweating ... a lot. I know, it's gross to imagine an old lady sweating. Somehow, I don't think I'm the only one! I've been daydreaming lately... about 75 degree days! heh. Other than in my mind is there really a place that stays 75 degrees all the time?? And if there is.. will someone please take me there?! But there was a bright spot in my day. Just when the day felt endless.... the mailman appeared... with an unexpected package! I don't know how to say Thank you to Cath so it sounds like so much more than just thank you. I feel like I have a little piece of England now! Ok, so it's a book... still... it was bought in England! How cool is that?!!!!! Waaay cool !! What a strange coincident that this book would come today ... the reason I think that is because I just finished reading Anne of the Island by L.M. Montgomery, a book which I never would have read had it not been for Cath and her review of Anne of Green Gables (which I bought and read not long ago). I found this book at the last show I went to and grabbed it up, even though it was actually book 3 of a series... 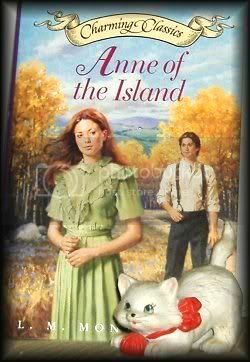 I can't tell you how delightful both Anne of Green Gables and this one, Anne of the Island, both were. It was like stepping back in time. To a more innocent time. A time most think of when they are older and think back to when they were young. I never read these books when I was young.. and I missed out. But I'm making up for it now. The books are easy to read. They fly by and time seems to stand still. Maybe it's the wish that things were still as simple as they seemed when we were young and didn't hold the problems of the world on our shoulders. It's such a short amount of time that we are innocent of so many things... it's no wonder we all wish we "were young again"... it's not really the "age" that we want... it's the feeling of so much hope. Marilla, was thinking of her whole past life, her cramped but not unhappy childhood, the jealousy hidden dreams and the blighted hopes of her girlhood, the long, gray, narrow, monotonous years of dull middle life that followed. And the coming of Anne- the vivid, imaginative, impetuous child with her heart of love, and her world of fancy, bringing with her color and warmth and radiance, until the wilderness of existence had blossomed like the rose. Marilla felt that out of her 60 years she had "lived" only the nine that had followed the advent of Anne. And Anne would be home tomorrow night. This book follows Anne for another 4 years. Her years away at college, with her frequent trips home to Green Gables for Holidays, and the realization that sometimes love is so close you can't see it. So.. I have LOTS to thank Cath for! ... it was a horribly hot day... that turned out good anyway! Set on the outskirts of a small Southern town, The Grass Harp tells the story of three endearing misfits--an orphaned boy and two whimsical old ladies--who one day take up residence in a tree house. AS they pass sweet yet hazardous hours in a china tree, The Grass Harp manages to convey all the pleasures and responsibilities of freedom. But most of all it teaches us about the sacredness of love, "that love is a chain of love, as nature is a chain of life." This volume also includes Capote's A Tree of Night and Other Stories, which the Washington Post called "unobtrusively beautiful...a superlative book." I've seen the movie of The Grass Harp a number of times. It had a great cast.. but even with that it wasn't what would be considered a "hit". When a number of reviews showed up for "In Cold Blood" I remembered that Truman also wrote a movie that I had enjoyed but never read the actual story... So I fixed that, and just finished reading The Grass Harp. I feel sure Truman Capote wrote the story before the movie was made. Knowing this, I was surprised at how much the movie stuck to the book. This is one of those cases where I'd say it was an exact match. Which is good.. because that means I got to enjoy both the movie and the story. 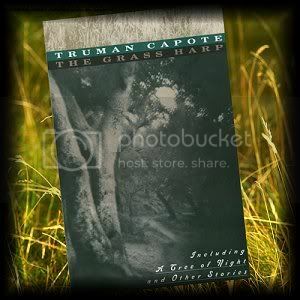 For anyone interested, the story is actually only 100 pages long and the book it's in comes with some other short things Truman wrote... but the one that is the best is The Grass Harp. Basically, it's about some old eccentric people. Not the first thing many young folk would want to read about. But long before I, myself, became one of those old people, I did find that stories and movies about elderly people were really interesting. Maybe because they were stories told from the heart. ... and in that respect, this one is no different. Barely one day after fulfilling his second mission for King Vandemere as Royal Reporter of the land of Serendair, young Charles Magnus Ven Polypheme—known as Ven—is off on another adventure. To keep them safe from the wrath of the Thief Queen, whose rage at their escape from the Gated City knows no bounds, the king sends Ven and his friends on an important mission. Their journey takes them across a wondrous land filled with marvels—and danger. For the mission the king entrusts to Ven is a delicate one: to discover the cause of a dispute between two warring kingdoms—and the answer leads Ven straight into the lair of a very angry dragon…. Fans of The Floating Island and The Thief Queen’s Daughter—both chosen as Book Sense Children’s Picks—will love this third enchanting adventure in The Lost Journals of Ven Polypheme series by bestselling author Elizabeth Haydon. 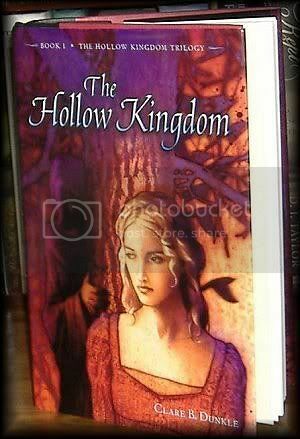 This whole series of books, beginning with The Floating Island and then The Thief Queen's Daughter and now The Dragon's Lair have been very enjoyable! Elizabeth Haydon has made most of her characters nonhuman. Ven himself, being a Nain. The earlier books told you enough about each character to make you interested in "what will happen next". She also concludes each books to a satisfactory ending without holding cliff-hangers over your head! And she recaps enough at the beginning of each book so that for people like myself who may not remember all of the last book, I don't have to reread it inorder to read the newest one! If I were to make a complaint on this latest of her books about Ven I would say that things happened really quickly, and maybe the book could have been longer ! This is a good complaint though.. since it means I would have enjoyed reading it as a longer version! I see she has the next title mentioned in this book, but it seemed uncertain at the end of the book if her next book will have the same protagonist or not... I hope so.. There's no doubt that I'd be happy to read another adventure with the young Nain and all of his young friends! Starred Review. One bite of a magical golden apple holds the key to a Scottish town's renewal and may grant the heart's desire for three lucky American women, provided they take a leap of faith in this enchanting tale from Tuttle (The Mysteries). In the coastal village of Appleton, Ashley Kaldis, who's recently lost her parents, traces her grandmother's roots; Kathleen Mullaroy works as librarian of the local (haunted) library; and Eleanor "Nell" Westray, a grieving young widow, cultivates a rare Scarlet King apple tree that produces the once-in-a-lifetime Golden Queen apple. This is the same apple that the oddly ageless Roan Wall, the town's recently returned prodigal son, was supposed to share some 50 years earlier with the then Apple Queen, who instead ran away to America, insuring Appleton's decline. Full of delightful characters, engagingly fey imagery and well-researched Celtic lore, this superior fantasy provides a juicy denouement fit for a queen. Very strange.... the first half of this book seemed to read very slow for me. Once or twice I thought I was "lost" but then it began to come together, and I wound up enjoying the book. I've never read any Celtic Lore and this was a good introduction to it. The Celtic Elysium was situated not, like the heaven of the hymnist, "above the bright blue sky," but here upon earth; but, as it was a subjective world, its location was vague.... Sometimes it was a mystic green island that drifted on the western seas, Men caught occasional glimpses of it, half hidden in a twinkling mist, but when they attempted to draw near, it vanished beneath the waves. The Green Island has been seen in almost every latitude from Cape Wrath in Scotland to Cape Clear in Ireland. Sometimes it was identified with a particular isle of the West. To enter this Otherworld before the appointed hour of death, a passport was necessary. This was a silver branch of the mystic apple-tree, laden with blossoms or fruit- though sometimes a single apple sufficed- and it was given by the Queen of Elfhame or Fairy Woman to that mortal whose companionship she desired. It served not only as a passport, but also as food: and it had the property of making music so entrancing that those who heard it forgot all their cares and sorrows. I enjoyed how it was written, how from all things being "normal" to small things "just not seeming right"... it led you into the "otherworld" and back again without realizing just what was happening until it already happened. Overall... an interesting read! The mailman rang the doorbell... that means one thing... Amazon! These came pretty quick! And I'm glad because two of them are follow up books to ones I've already read. 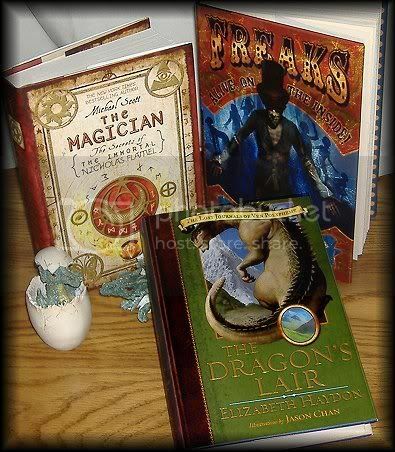 The Dragons's Lair is the third book by Elizabeth Haydon about the journals of Ven Polypheme. 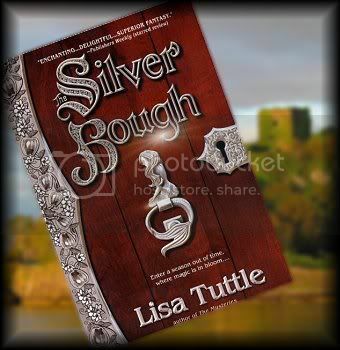 The first two books were enjoyable enough for me to continue the series! 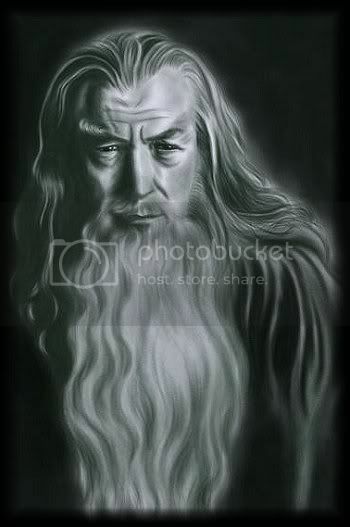 The Magician ( The Secrets of the Immortal Nicholas Flamel) is the second book for Michael Scott. 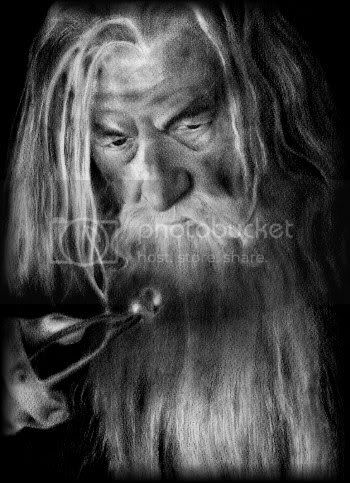 I will admit my attraction to the first book: The Alchemyst: The Secrets of the Immortal Nicholas Flamel, caught my eye because I remember hearing the name Nicholas Flamel in the Harry Potter books/ movies and was curious to see how he would be used by someone else. 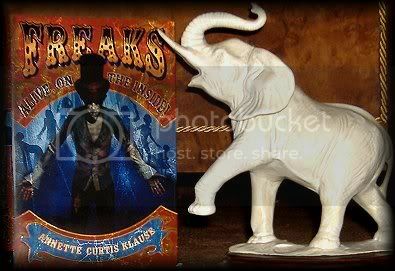 I remember Freaks: Alive on the Inside, was reviewed by Carl quite some time ago.. and I saw it again recently... both times interested me but when Carl did it I only added it to my wish list... this time I sent for it. All this, and my adopted son Chris, also sent me a book I know I want to read.. (Sabriel) . but unlike some people, if the book already has the full trilogy out.. I have to have it when I begin reading... I can't read one book and then go to something totally different when I KNOW the next book is out there ! I've seen Chris not read a full trilogy when they are all available but he's not alone.. I've seen a number of people do that and I don't know how they do it! So, my next order will be for the other two books by Garth Nix. Which I hope to order before July is over. 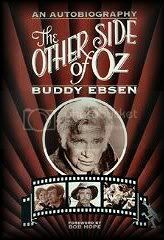 I'm also waiting for a used book that I ordered...*groaning here*... this one I sorta blame Lee Meriwether for... but only because I totally forgot about this book called "The Other Side of Oz" by Buddy Ebsen. 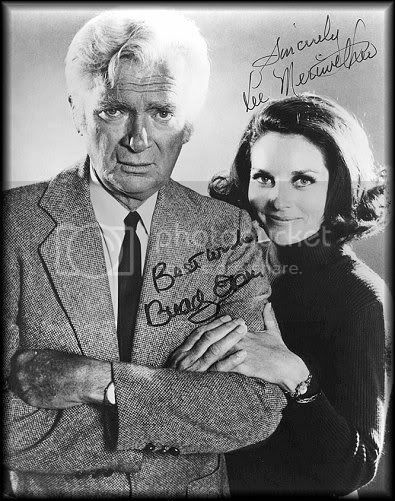 On Lee's table of pictures she was selling were two photo's of her and Buddy Ebsen, one was a cast photo, they were both from Barnaby Jones, a detective series that Lee was a regular in. 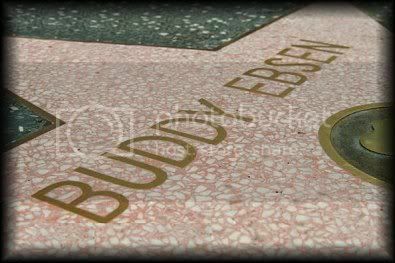 I always loved Buddy Ebsen... 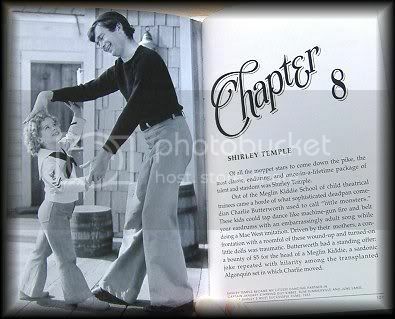 I think from the time I remember seeing him in a black and white movie dancing with a very young Shirley Temple! Yep, ol' Jed Clampett was really a song and dance man! But we, of the older generation, knows that little fact!.. anyway, Lee mentioned the book several times while I was sitting there helping her and I made it a point to come home and go right to Amazon!... of course... it was no longer in print! Doh! So off I went searching for a really good used copy. 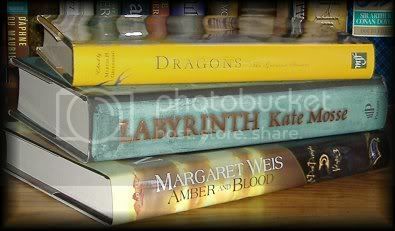 I have found that Amazon used books aren't always the best buy or the best condition for the price (but many are good!).. when I'm not totally happy with my findings I search on Alibris and I found a used "like new" hard back copy for 2.50 !! Yeah, I had to pay shipping, but still that came out pretty cheap! Anyway, I am really looking forward to that one, and I just received an email that it was mailed today! Cool Beans! So I think I will read The Dragon's Lair next as I the type is a nice size and I know it will be one of those "fast reads"... by then I hope my copy of The Other Side of Oz will be here... and about then I should be able to send for the rest of the Garth Nix books! (oh woof!) 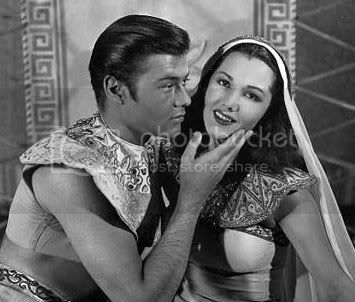 So.. this is Turhan Bey, along with Maria Montez in a scene from Ali Baba and the Forty Thieves. Turhan was the slave, that helped Jon Hall protect Maria Montez... and i was going to grow up and marry Turhan and he was going to protect me the way he protected Maria Montez! It was definitely love. Whatever "love" is to a 10 year old, .. that's what I had! 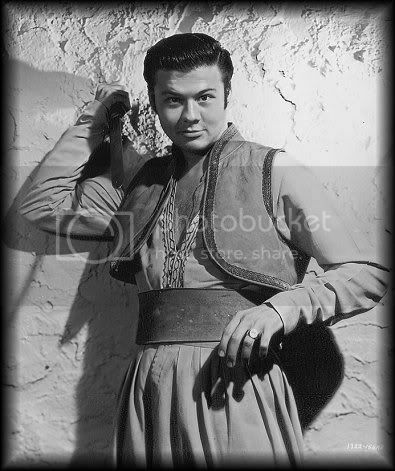 Then one day (I'm not sure how old i was.. maybe 12) I heard that Turhan Bey had died. I was heart broken! How dare he die and not marry me! Fast forward 35 years or so.. 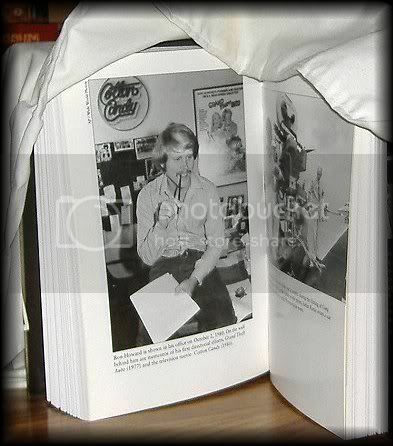 I was lying in bed in Encino California listening to a radio show called "Gregg Hunter Show". It was a call in show where all the people that called in discussed old movies or old actors, with the exception of one man who would call in and give a "review" of an old movie and then a "new" movie. I did the best sit up in bed that I had ever done! Turhan Bey? But he's dead! I continued to listen and learned that Turhan Bey was, (duh) not dead but had moved back to Vienna, where he had taken care of his mother over the years. And indeed he was going to make a guest appearance on Seahunt. Then a character walked on and i knew before he even open his mouth to hear his wonderful accent.. it was Turhan Bey. 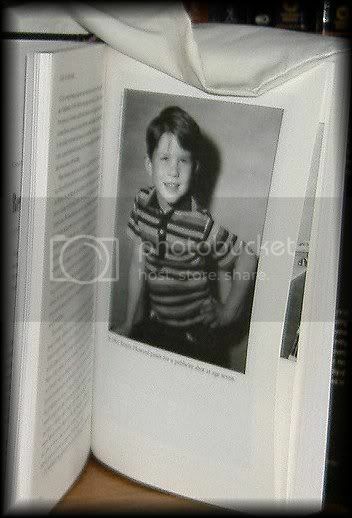 Of course he was older now.. (but then, so was I! ), but there was no denying those eyes or that voice.. it was him! I found I had a huge grin on my face as I watched his performance on the show, proving you never forget your first love. The flip side of this story is that after I found out that Turhan Bey was alive and well and doing guest appearances.. I knew the minute I saw him that I had to write to him. Subsequently, I went about typing a four page letter to him spilling my guts out! I told him EVERYTHING ! How i was inlove with him when I was 10.. how i had heard he was dead.. and most importantly how I found out he was alive and doing Seaquest! Oh, I also mentioned how shocked I was, how i went crazy looking for a blank vhs, and how I sat right in front of the t.v. waiting for him to appear. (Like he needed to know all of this right?!) At the end I did ask for an autograph.. "if he did them". The only time the world beats a path to your door is when you're in the bathroom.